HOOVER - Marion County Sheriff Kevin Williams has recently assumed the role of president with the Alabama Sheriff’s Association (ASA). The Hamilton native will become the state contact for media relations, as he will be the face for the association. His responsibilities will also include working closely with state lawmakers as proposed bills come before the Senate and House of Representatives for consideration. Williams was installed as the new president during a ceremony held in Hoover at the Embassy Suites hotel on Tuesday, Feb. 12. The new title will come in addition to his current role as Marion County’s sheriff. The president’s position is not a full-time job, nor does it come with compensation. “This is an honor and a privilege,’’ Williams said in a Journal Record interview. “To be entrusted with these new responsibilities by my fellow sheriffs means a great deal to me. Williams, 46, rose to the rank of president after moving up the officers’ ladder over the last several years. Prior to his tenure as president, Williams served as sargeant at arms, second vice president and vice president. He was first introduced to the officers panel following his nomination by the ASA nominating committee four years ago. The association is comprised of sheriffs from all 67 counties in the state. His tenure as president will last for 12 months, when he will shift into the role of past president. In addition to representing the association with the state’s lawmakers in Montgomery and in media interviews, the president is charged with the duty of presiding over the associational meetings, appoint ing committees, calling and conducting special meetings and executing all contracts on behalf of the association as needed. Almost 50 Marion County residents attended the recent swearing-in ceremony. Former probate judge Annette Bozeman Haney conducting the official oath of office. “I wanted Annette to do this because she has been the one to swear me in each time I have taken office,’’ said Williams, who first assumed the role of Marion County sheriff after winning election in November 2002. “Having so many friends, family and employees to be in Hoover for the event was special to me. I appreciate all of them taking the time out of their busy schedule to be there on an important day,” he said. Asked if he had envisioned attaining the highest office in the association, Williams said this was something he had wanted to do for a number of years. “Since first coming into the association, I felt like this was something I would want to do--serve as president,’’ said Williams. “I have had the chance to serve on a number of committees with the association, in addition to my previous responsibilities as an officer. Williams graduated from Hamilton High School in 1984. His law enforcement career began in 1992 with the drug task force, which was serving Marion and Winston counties at the time. 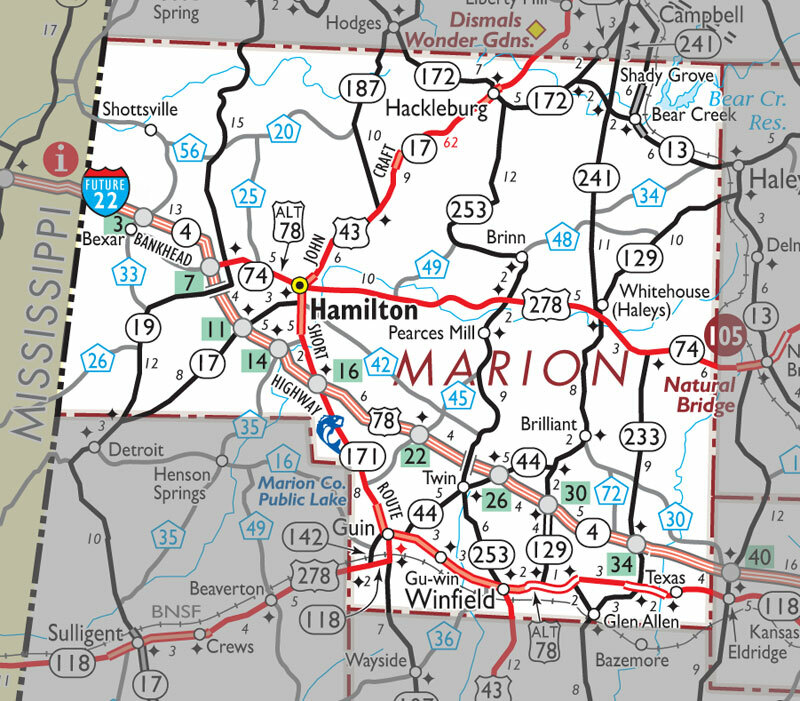 After a brief stay with the task force, Williams served as Marion County deputy sheriff for more than a year under former sheriff Max Brasher, Jr.
Williams would spend nine years with the Hamilton Police Department prior to being elected as the sheriff in 2002. He was sworn in as the county’s highest-ranking law enforcement officer on Jan. 21, 2003. Williams and his wife, Renee, have been married for 29 years and have one son, Carl. The Williams have a daughter-in-law, Lacy, and a grandson, Trent. Williams’ brother, Wade, is currently serving as the Hamilton mayor while his wife, Vicki, works in the central office for the Marion County Board of Education. The sheriff has another brother, Jonathan, along with a sister-in- law, Shannon. The sheriff is the son of J.V. and Carole Williams. Former Marion County Judge of Probate Annette Bozeman Haney swears in Marion County Sheriff Kevin Williams (center) as the new president of the Alabama Sheriffs Association. The ceremony was held at the Embassy Suites in Hoover on Tuesday, Feb. 12. Shown holding the Bible for her husband is his wife, Renee. Marion County Sheriff Kevin Williams (center) was sworn-in as the new president of the Alabama Sheriffs Association on Tuesday, Feb. 12, at the Embassy Suites in Hoover. The officers posed for a group photo following the ceremony: (from left) Baldwin County Sheriff Huey "Hoss" Mack, first vice president; Coffee County Sheriff Dave Sutton, sergeant at arms; Williams; Escambia County Sheriff Grover Smith, immediate past president; Dale County Sheriff Wally Olsen, chaplain; and Marshall County Sheriff Scott Walls, second vice president. Not shown is secretary/treasurer Kenneth Ellis, Hale County sheriff. Williams joined by family, staff members at swearing-in ceremony Marion County Sheriff Kevin Williams was recently sworn-in last week as the new president of the Alabama Sheriffs Association. Family members who attended included (top photo, front row, from left) niece Lindsey Cantrell, sister-in-law Dianna Cantrell, mother Carole Williams, wife, Renee, Kevin Williams, daughter-in-law Lacy Williams, brother Jonathan Williams, (back row, same order) father-in-law Charlie Hamilton, brother-in-law Richard Cantrell, father, J.V. Williams, grandson Trent, son Carl and not shown are brother Wade Williams and his wife, Vicki. Sheriff’s department employees shown with Williams at the ceremony are (bottom photo, front row, from left)Sgt. Billy Pendley, jailer Joe Vasquez, Marion County Drug Task Force Administrative Assistant Penny Lindley, dispatcher Heather Burgett, Kevin Williams, court liaison Dana Ritch, administrative assistant Shelly Berry, dispatcher Patsy Moon and deputy Matt Pugh, (back row, same order) Lt. Jeff Davis, investigators Damien Allen and Scott Welch, deputy Randy Tice, narcotic investigator Chris Sims.